Here we see a classic example of right idea, wrong execution. 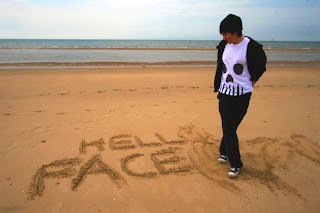 This young castaway attempts to write 'HELP' in the sand so that a passing plane might spot it and come to the rescue, but the Goth nature comes to the fore and instead all that comes out is some introspective naval gazing haiku element. You'll be waiting sometime for a refreshing Snakebite & Black young Darkling! I imagine that said "Hello Facebook," but the quasi-goth already got the photo he/she wanted.